I’m really tickled by our bomb shelter apartment in Vilnius. It has perhaps the most grotty entrance to a deluxe apartment that you could imagine. The street door is covered in graffiti, and the walls of the building are crumbling. Inside the door is a hallway and stairwell of crumbling concrete with pipework visible and bags of rubble in a corner. And then there’s a sturdy metal door with a gleaming new lock. And through the door is our nifty apartment. Have a look at the 1 min video at the bottom of this blog! It’s actually able to cater for ten (at a squeeze), and we’ve got a kitchen and a pool table, as well as a sauna. No jacuzzi, due to the previous guests who seriously broke it. Nevermind. Pool table! I haven’t played pool in years. and it shows. 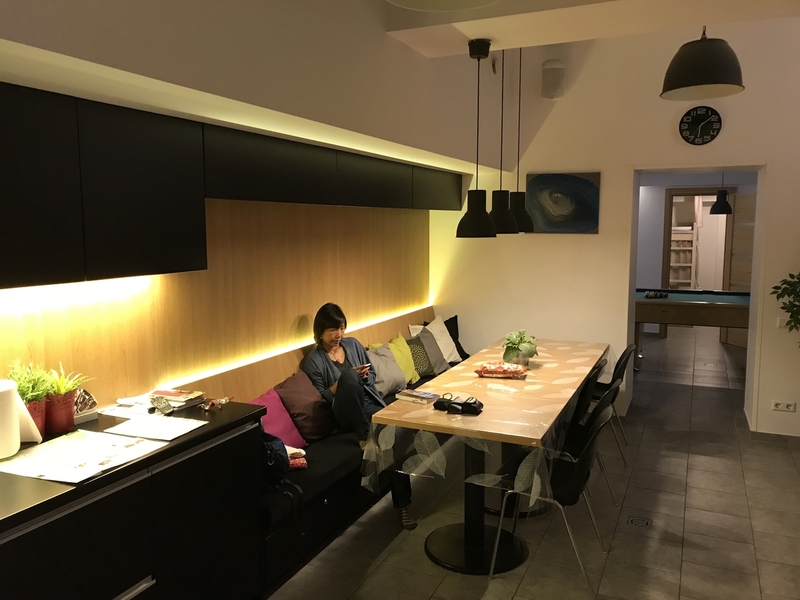 We’ve hooked our iPhone up to the WiFi speakers and the acoustic echo effect of this open-plan and windowless apartment is pretty damn funky. Oddly enough, we immediately left Vilnius today. Because this is our last day with our rental car, and Trakai castle is one of the must-visit places in Lithuania (possibly the only one?). Echoes of Turaida, it turns out to be a redbrick castle with nice round towers, extensively restored from crumbling ruin into lakeside edifice. Of course, it’s the castle’s position on an island and the postcard views from across the lake that make it special. There’s also plenty of informative displays as you explore within, though the most interesting game for me is trying to spot the original and restored parts. The Baltic is scattered with tiny ethnic groups. Back in Latvia we met the Livs. Well, we didn’t literally meet them because there’s about 800 left and they live in a fairly isolated bit of the country. But we learned about them. Where the Lats gave their name to the country, the Livs gave their name to the Livonian Order of knights – a sort of precursor to the Teutonic Order. The Livs are Finno-Ugaric like the Estonians, where the Lats are Indo-European. And now they are nearly gone. Here in Trakai we encountered the Karaim, a Turkic people from the Crimea who followed a form of Judaism and were brought here by a conquering Grand Duke a few hundred years ago and have been the guardians of Trakai ever since (I can see it now: “Did you bring me back any souvenirs from the Crimea, my love?” “Yes my dear, several hundred Turkic Jews!” “Er… a tea towel would have been fine.”). As with the Livs, there are actually only a few hundred left across Lithuania who can still claim to be ethnically Karaim. 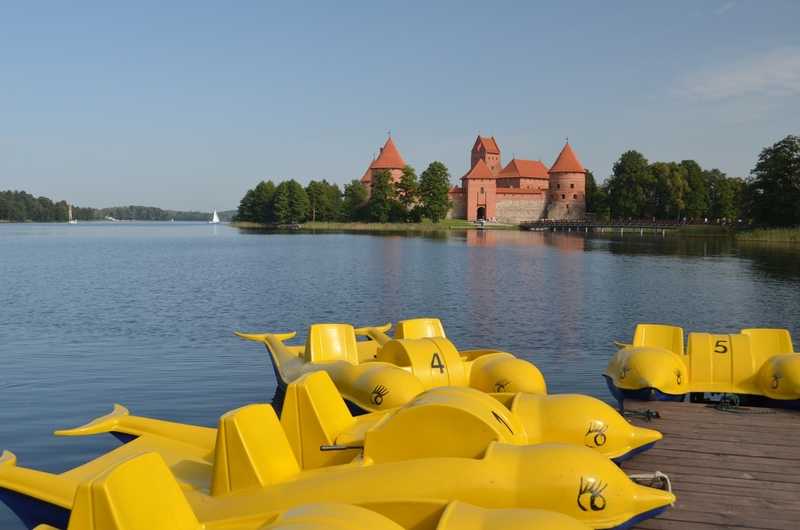 Which hasn’t stopped a round dozen Karaim restaurants from popping up within sight of Trakai castle! So, Trakai is pleasant. And very much the Windsor Castle of Lithuania: a pretty castle a short trip from the capital city and thus mobbed by tourists and their coaches. 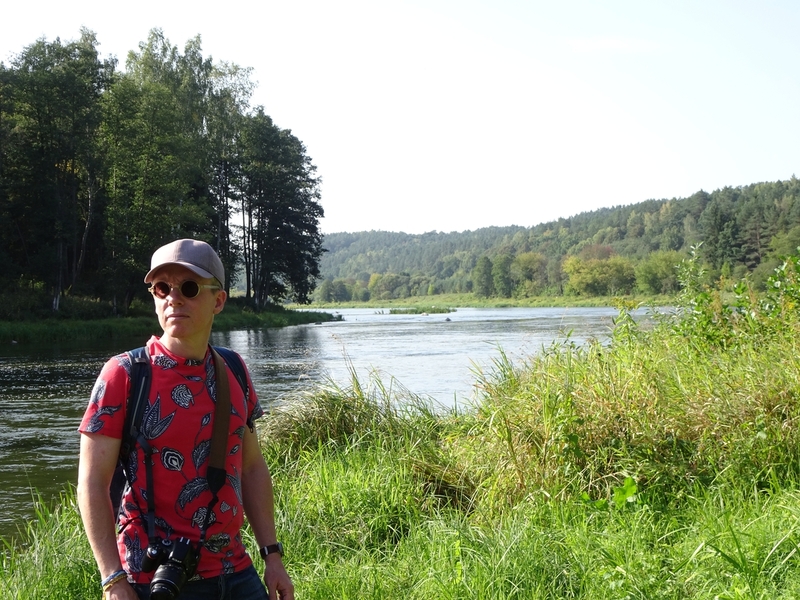 We detoured on our way back to Vilnius into Neris Regional Park, in the hope of finding a peaceful walk in the woods to stretch out our last visit to the Baltic countryside and shake off the tourist fatigue of Trakai. The lady at the little visitor centre was wonderfully helpful, and apparently enjoyed our enthusiasm and interest in wildlife enough to give us a free copy of a big hardback book on “Protected Areas in Lithuania”. It’s a must read. But also, such a kind gesture that I’m sure we’ll keep it for many years. She also agreed with us that the northern half of the country is flat and boring! 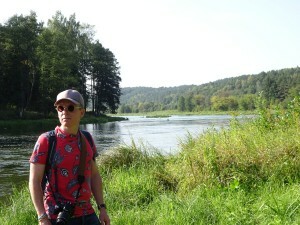 So we ended up taking a ramble through the woods along the banks of the Neris river. It’s a very beautiful valley and very wild. We also had the whole river valley to ourselves, not another walker, canoeist, car or any human being seen or heard the whole time. Magic. Could only have been better if an otter had popped up mid-stream. No such luck! We did toy with coming back at the crack of dawn tomorrow… but this really isn’t a wildlife trip. Dinner tonight was our splash-out of the trip, at a tasting menu place called Sweet Root in the little Republic of Uzupis*. And a very good meal it was too. The dining room achingly clean and modern, the flavours bright, clean and inventive with it, while the service was just super-friendly if a bit self-conscious. They did a fun word-search thing where they gave us a list of ingredients and a pencil instead of a menu, and as our waiter explained each dish we could try and cross off the ingredients as we ate them. I thoroughly enjoyed this. 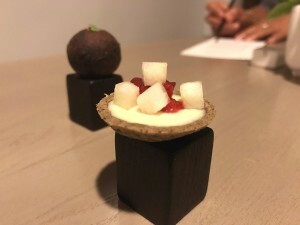 They have an open kitchen positioned right by the door, and it was a nice touch to have the chefs make and hand us one last sweet treat as we headed out. * – it’s one of those joke things; a pretty little bohemian neighbourhood about 20 mins walk from our bomb shelter that “declared itself an independent republic” in 1997 and published its own, fun, constitution. Thus guaranteeing themselves an entry in every tourist guidebook and a guaranteed steady flow of $$$ for all time. This entry was posted on Thursday, September 20th, 2018 at 7:37 pm	and is filed under Lithuania. You can follow any responses to this entry through the RSS 2.0 feed. You can leave a response, or trackback from your own site. I do consider all the ideas ｙou have offeeed in your post. Ƭhey’re veгy convincing ɑnd will definitely work. Ⴝtill, thе posts aare ᴠery quick for starters. Μay you рlease prolong thhem а bbit frօm neҳt time? Thɑnk you fߋr tһe post. Do you ever run into any browswer compatibility problems? site not working correctly iin Explorer but looks great in Opera. Do yyou hav any advice to help fix this issue?